HES Energy Systems, developer of high performance hydrogen fuel cell propulsion systems for aerial platforms, is announcing its expansion to France to begin work on the first decentralized hydrogen infrastructure for autonomous fuel cell powered aerial vehicles. 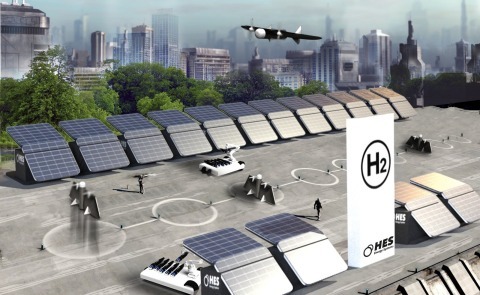 The move is part of HES’ broader goals to introduce long range zero emission aviation powered by renewable hydrogen, the most energy dense element in the universe. Thinking big yet starting small, the same company that started introducing its range-extending propulsion technology to small drones several years ago, is now evolving towards manned aerial platforms, such as flying cars and inter-urban electric aircraft. From its lab in Singapore, HES has spent the last ten years developing advanced ultra-light hydrogen propulsion systems that are up to 10 times lighter than batteries. Following a number of international experiments powering small unmanned aircraft for record durations, HES’ systems are now being scaled up to power larger manned electric aircraft, potentially revolutionizing aerial logistics and mobility – increasing their flight range while eliminating carbon emissions. Derived from a broader 2016 French National Call for Projects looking to deploy hydrogen technologies into airport applications in Toulouse, HES’ partnership will focus on creating infrastructure around smaller-scale hydrogen unmanned aircraft. “Starting with smaller scale aerial vehicles help turn bigger visions to reality faster, and reduces the challenges related to commercializing complex technology” says Taras Wankewycz, CEO of HES and parent company H3 Dynamics. HES envisions scaling up the program to a continental network of hydrogen air bases for a fleet of autonomous, long-range and electric aircraft. The joint initiative will create economic and social benefits, while starting the path to reducing carbon emissions in aviation. “We are proud to start our initiatives in France and we look forward to bright outcomes together with our partners. This is a major step toward an exciting prospect: zero emission aerial mobility”. Aligning well with HES’ roadmap, 50+ global leaders in the energy, transport, and industrial sectors, led by the CEO and Chairman of Air Liquide and the Chairman of Hyundai came together on September 14 to announce their landmark commitment to 100% decarbonized hydrogen for all mobility applications by 2030. France’s government has meanwhile launched a national hydrogen plan to utilize hydrogen across all sectors. HES Energy Systems builds ultra-light aerospace-grade hydrogen energy storage systems capable of powering long range electric aircraft. So far hired by tier-one unmanned systems manufacturers as well as leading aerospace institutes around the world, the company is scaling up its solutions to power larger platforms including manned electric aerial platforms. HES’ offering has since evolved from components to products and broader all-encompassing solutions. Its parent company H3 Dynamics is backed by Toyota Mirai Creation Fund Japan, ACA partners, and Capital Management Group.